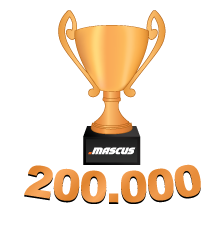 Mascus, one of the biggest online marketplaces in the world for the sale of transportation vehicles, construction machinery, agricultural, material-handling equipment and forestry, has reached a major milestone in its growth – 200,000 online advertisements. Mascus has become not only a truly global brand but also a brand that is creating new markets for dealers and end buyers worldwide. Their global presence is built on extremely strong foundations particularly in the key markets of Germany, UK, France, the U.S and the Nordic Region. Mascus’ commitment to continual improvement of their services has been a key part of their success. Their new platform launched in 2010 and the heavy industry directory, Mascus Locator, now has over 32,000 listings. More recently Mascus launched three new services to help dealers do business more effectively. The Auction service allows buyers to find machines, trucks or equipment in both offline and online auctions globally while the new Valuator service lets dealers price items quickly and accurately using the best market data available. This is the first time dealers have had an easy-to-use tool to provide accurate market information within minutes. Finally, the Dealer Mobile solution allows dealers to access their stock via mobile devices. Mascus - Is an online marketplace for construction machines, farm machinery, forestry, material handling and groundscare equipment and transportation vehicles. Product ranges include tractors for sale, trailers for sale, used trucks for sale, diggers, box trailers, mini diggers and excavators. Mascus makes trading in used machinery and equipment quicker and more efficient by collecting in one place information about the supply and the demand. All dealers, producers, and end users are welcome to offer their used machines and equipment for sale via the marketplace.